It is with great pleasure that Manta Industries and Highseas Millwork announce the merger of two great forces. As of July 12, 2010, Manta Industries and Highseas Millwork will be run by Privateer Divers LLC. Privateer Divers™ consists of a staff with over 56 years combined dive experience. Our skilled and highly trained staff are avid cave and wreck divers. Highseas Millwork, a subsidiary of Privateer Divers, manufactures a top quality, reasonably priced line of dive equipment. Our equipment includes, but is not limited to: The Joe McGrath Signature Series™ of dive harness hardware, harness hardware for rebreathers, clips, rings, knives and various other dive products. The Joe McGrath Signature Series™ was originally designed and produced by Joe McGrath out of his shop in Massachusetts. The Joe McGrath Signature Series™ allows divers to customize their own harness or have us build you the harness you have always dreamed of. Graduating from Florida Institute of Technology with a degree in Underwater Technology in 1979, Eric worked as a Commercial Diver both in the United States and abroad. Eric is an avid diver and was first certified as a SCUBA diver in 1972. Eric continues to explore the underwater world whether on his rebreather deep inside a cave or technical wreck diving off the East Coast. Richard Simon is currently a senior at Eastern Connecticut State University and is pursuing a degree in business. A Boston Sea Rovers and Frank Scalli Internship winner, Richard is now a PADI and a TDI dive instructor holding both recreational and technical ratings. He has been running Privateer Divers since it formed in 2007. 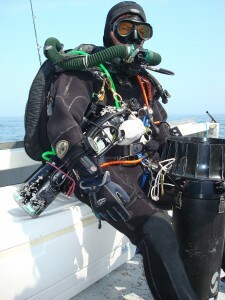 Richard is an avid diver; especially enjoying diving deep caves on his rebreather and wrecks off the East Coast.